WASHINGTON -- Longtime Trump adviser Roger Stone says a car he was riding in this week in Florida was struck by a hit-and-run driver. 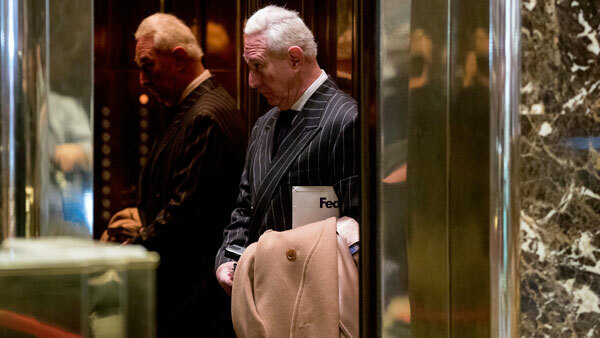 In a statement to The Associated Press, Stone described the incident as "suspicious," coming as he is under scrutiny for his communication with the Russian-linked hacker Guccifer 2.0. Stone tweeted that he was uninjured in the crash except for blurry vision in his right eye. Stone says the car he was riding in was "T-boned" by a large, gray four-door car with a tinted windshield. The Broward Sheriff's Office says the driver the vehicle did not stop or make any attempt to exchange information. Police says Stone was a passenger in a car driven by John P. Kakanis, 29, of Hallandale Beach, Florida.